Squirrel was Here, originally uploaded by espeedy123. Your eyes do not deceive you. 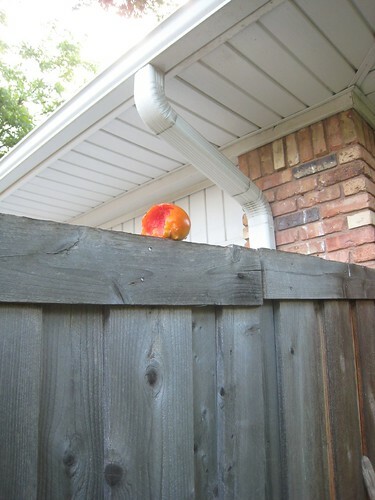 This is a ripe, half-eaten homegrown tomato perched atop my backyard fence. Deposited by a squirrel no doubt. Looking outside my kitchen window, I witnessed perhaps the same squirrel running up my neighbors roof with a smaller red one in its filthy undeserving mouth. How depressing. To avoid this I believe you either must pick them green and let them ripen inside or create a physical barrier with netting. I hate to pick them unripe because they don’t taste as good. What’s the point? But I’ve been so busy the net’s not quite situated right. Obviously. Need to work on that. 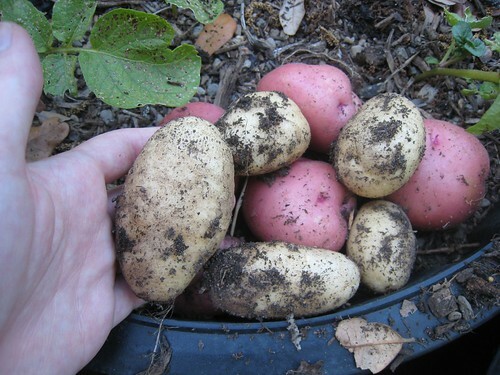 But until then, it appears I’m writing off a chunk of my crop to the squirrels. Kennebec, Red Lasoda, originally uploaded by espeedy123. Kennebecs are the white ones. They turned out smaller than the red ones. Not sure why.